“Thukrao Ab Ke Pyar Karo, Main Sattar Ka Hoon!” Jagjit Singh started his concert with these lines earlier this year, which I was fortunate enough to have attended. At the end of that concert around 10.30 pm or so, people started a chorus for ‘once more’ for some more time and ghazals, when again he said “Main Sattar Ka Hoon, Ab Sone ka time ho gaya”. The audience gave him a standing ovation as he said that and left the stage leaving everyone wanting more. As I left the concert, I wondered whether it was this simplicity that he brought to the art of ghazal singing that made him immensely popular specially with the non-expert. In some sense, perhaps Jagjit Singh democratized the musical genre of ghazals in India. Before Jagjit Singh, the ghazal was for connoisseurs of Urdu. The singer sang a complicated medley of two liners that everyone said “wah wah” to, but very few really understood. The writer or the shaayar was someone deeply educated and learned in Urdu, and the singer equally proficient in the structure of the couplets. The common man could not connect with the poetry easily. In that sense, the genre of ghazal singing that Jagjit Singh almost invented on his own did not even exist before him. Before him, you had cryptic Urdu lyrics, heavy harmonium and stretched renditions of couplets that the audience required not only some knowledge of, but immense patience to enjoy. Begum Akhtar, Mehdi Hassan and, after him, Ghulam Ali were the maestros in that genre. In that sense, Jagjit Singh and his style were initially misfits in the classical ghazal genre. He selected beautiful poetry for his renditions, but ones that had reasonably understandable lyrics with a mix of Hindi, Punjabi flavors to the original Urdu couplets. Instead of stretched renditions that the traditional ghazal singer took pleasure in, he simply provided soulful, melodious renditions in a silken voice and stirring music which was not in the traditional classical ghazal genre. And he introduced the unheard of guitar into ghazals. He popularized the ghazal in Hindi films which necessarily meant that they had to be commonly understood both in lyrics and music. In jointly singing with his wife Chitra Singh, he broke with tradition and made the ghazal much more approachable. 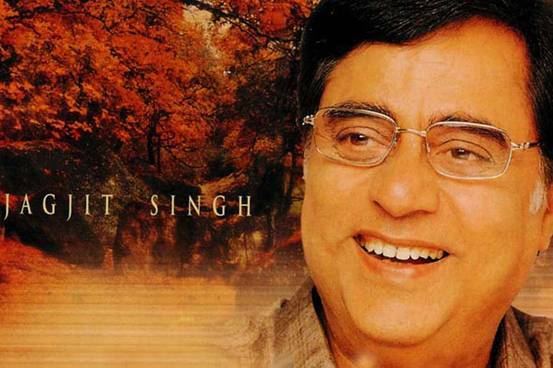 I got hooked on to Jagjit Singh in my teen years and have been a fan since then. At that time, the general impression was people who listened to ghazals were either eccentric or depressed! And then there was this impression that there was also a third category – people who heard ghazals because they wanted to appear classy, even though they did not understand a word of it. Now I think with over four decades of Jagjit Singh and I think 50 plus albums, one can safely say that – that is no longer the case, as the ghazal has found its place in many a common home. Jagjit Singh can be credited with bringing simplicity and melody into a form of music that always has an element of melancholy in it. And even the purists cannot argue with the fact that in bringing the ghazal to the masses like myself, he really did democratize the ghazal. I really like it whenever people get together and share ideas. Fantastic site, stick with it!